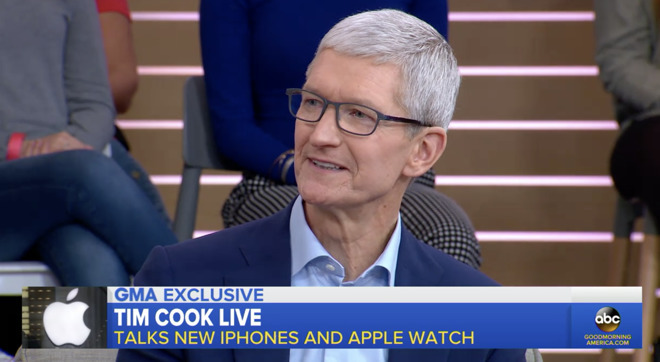 Tim Cook, appearing on ABC's Good Morning America Tuesday, demonstrated the iPhone XS and XS Max, while also answering questions posted via Twitter the day before. Roberts began the interview asking about the trade wars, and the announcement Monday of new tariffs on goods from China. Cook appeared live in ABC's Times Square studio in New York. "The iPhone is assembled in China, but the parts come from everywhere including the United States," Cook said. "The glass comes from Kentucky, there are chips that come from the U.S., and of course the research and development is all done in the United States. So, I don't want to speak for them, but I think they've looked at this and said that it's not really great for the United States to put a tariff on those type of products." "I'm optimistic," Cook said of the chance to avoid retaliatory action from China. "Trade is one of those things where it's not a zero-sum game... I'm optimistic that the two countries will sort this out and life will go on." Roberts also asked Cook about what responsibility he feels now that Apple has become the first trillion-dollar company in U.S. history. "From my point of view, Apple could only have been created in America, we are a deeply American company," Cook said, "so we feel tremendous responsibilty to help our country." He also talked about Apple's job creation, its plans for "opening facilities in all sorts of places," as well as the company's efforts to encourage all students to learn to code. Roberts also asked about the high cost of iPhones, and whether customers are being priced out. "We want to make an iPhone for everyone," Cook said, reminding Roberts of the lower-cost older models that remain available. "The way most people pay for these, as it turns out, is they do a deal with a carrier, and they pay so much per month. So if you look, even the phone that's priced over a thousand dollars, most people pay about $30 a month for it, and so it's about a dollar a day." He added that the iPhone has replaced the digital camera, the video camera, the digital music player, and other products that used to require a separate purchase. "It's not about selling the most, but we've never been about selling the most, it's always about selling the best," Cook said, repeating previous remarks on the topic. Regarding the Apple Watch, Cook talked about several of the recent stories about the Apple Watch alerting users to heart problems, before touting the new ECG capability on the Apple Watch Series 4. 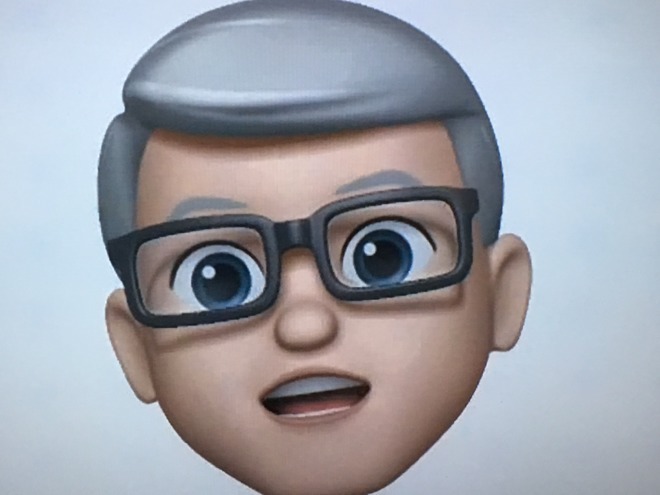 He also told Roberts about the portrait video feature and Memojis, although during the demo the Memoji of Cook's head briefly went on Roberts' body. The show had teased the segment with Memojis of both Roberts and Cook. Cook was in New York Monday, when he visited the Apple Store in Soho.